You may recall my announcement back in June that we are implementing a biodegradable packaging initiative. I am also preparing another announcement to coincide with our green efforts. However, I want to encourage each of you interested in promoting a safer environment to join the virtual march to Stop Global Warming. Join the march and become part of the movement to demand our leaders freeze and reduce carbon dioxide emissions now. We are all contributors to global warming and we need to be part of the solution. Last week, we made our annual expedition to the IRCE Conference in Boston (Internet Retailer Conference and Expo) to learn about all the latest and newest tools to enhance our web site and shopping cart. After all, Gloves-Online, is the oldest and largest glove retailer on the Internet. It is always fun to meet and mingle with all the global internet czars and we hope that what we learned will make your glove shopping experience easier and rewarding. Our major reward this year was finding ways to embed glove videos without overloading your connection (bandwidth) to our web site. That’s me standing outside the networking dinner on cold June evening in Boston. The food (and drinks) was great and we met some really neat internet gurus. Gloves are a huge business and nearly all gloves are packaged in film produced with petro-chemicals which we know is bad for the environment and worse when disposed and not recycled. We also know that industrial glove consumers rarely recycle product packaging which adds to the problem since they are the largest end user. Effective immediately, my company, GO Gloves™ (Gloves-Online.com) will begin converting to 100% biodegradable (compostable) packaging for our own brands which is expected to be completed in 6 months. We will begin to encourage our suppliers (you know who you are) to switch to biodegradable packaging. Notably: We are even switching to biodegradable packaging for sending glove samples. It doesn’t matter if you’re a consumer or an industrial user. I need your help to support this initiative by making a comment to this post. It would also help if you send a link to this post to other individuals who may share the same concern. I want our suppliers and even our competitors to see your support to this initiative. You can also contact the IGA (International Glove Association) at gloves@windstream.net to let them know you support biodegradable packaging. The IGA is the watchdog and voice of the glove industry. Together, we can make this happen. I appreciate your help and support in improving our environment. Footnote: If anyone needs assistance on PLA (polylactide) Film biodegradable packaging made from annually renewable plants, please let me know. Since most all gloves are manufactured in Asia, a conversion to PLA film packaging will be easy. PLA films and labels are readily available in Asia. This is a recent case study which I wrote for Assembly Magazine. Its a long post but it seemed easier to post it as is rather than provide a link. A prominent automotive parts manufacturer that powder coats parts for a hard, tougher finish needed better gloves that provided day-long comfort, good grip with high dexterity; eliminated deposit of body oils and lint on parts; and offer cost savings. The manufacturer tried various gloves for this new production line but workers found these gloves uncomfortable to wear for long-shift work; increased hand fatigue and perspiration; or left lint on parts. Other less expensive gloves also wore out quickly since workers had to load 25,000 parts per day onto the production conveyor hangers. The manufacturer turned to GO Gloves™ (Gloves-Online, Inc.) for a solution since they were experienced glove specialists and handled a broad range of gloves for industrial applications. Once GO Gloves identified the production requirements and problems together with worker’s concerns, they offered 3 coated glove options based on performance, comfort, and price. After weeks of testing the finished parts and reviewing worker evaluations, the manufacturer selected the All-Day® Micro-Dot Gloves since this model addressed each production problem and increased worker acceptance. 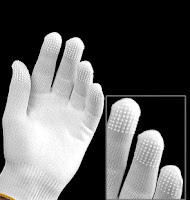 The solutions that the Micro-Dot Gloves provided were thinness, close fit, dust and lint free, great tactile and grip properties, breathablity, and worker comfort. Besides being very cost effective, the manufacturer only had to stock 2 sizes; one universal stretch size and one extra small size for women with small hands since more sizes would have been required with conventional coated gloves.